An Awesome Life: Easy Home Made Peanut Butter Cups! Who doesn't love Reese's Peanut Butter Cups?!? I mean, c'mon. They're so. good. Right? Unless you're allergic, of course. While the real deal is irresistible, wouldn't it be neat to discover that not only can you make your own, but that it is so simple too? True story ladies and gents. And if I can do it, anyone can. Recipe #1 is what originally caught my eye, but with Thanksgiving being this past weekend, the addition of pumpkin in Recipe #2 inspired me to experiment a bit. I don't have any specific measurements as this is a recipe that I figured could afford some experimentation, but I will try my best to be as accurate and descriptive as possible. 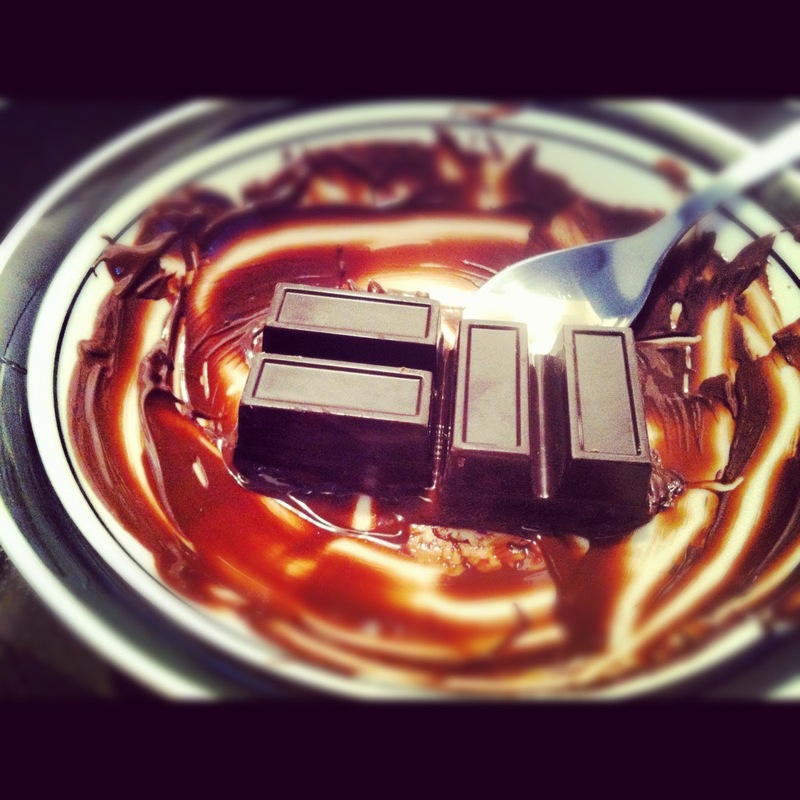 3) Place 1/2 the chocolate in a small bowl, then place the bowl in the warm stove-water (a double-boiler would also work, I just do not own one). Stir chocolate as it melts, making sure that it's completely melted. *Be careful not to burn the chocolate, you really only need the bowl to be just warm enough to melt the chocolate, so keep an eye on it! This is also why you don't put chocolate in a pot directly on the burner - it would burn the chocolate. Also be careful not to get water in the chocolate because it will seize and that's no fun! I know, I know, lots of rules - I promise, it's really not complicated! 4) Carefully spoon or pour chocolate into the bottom of 8 mini-muffin cups, dividing evenly amongst them all. 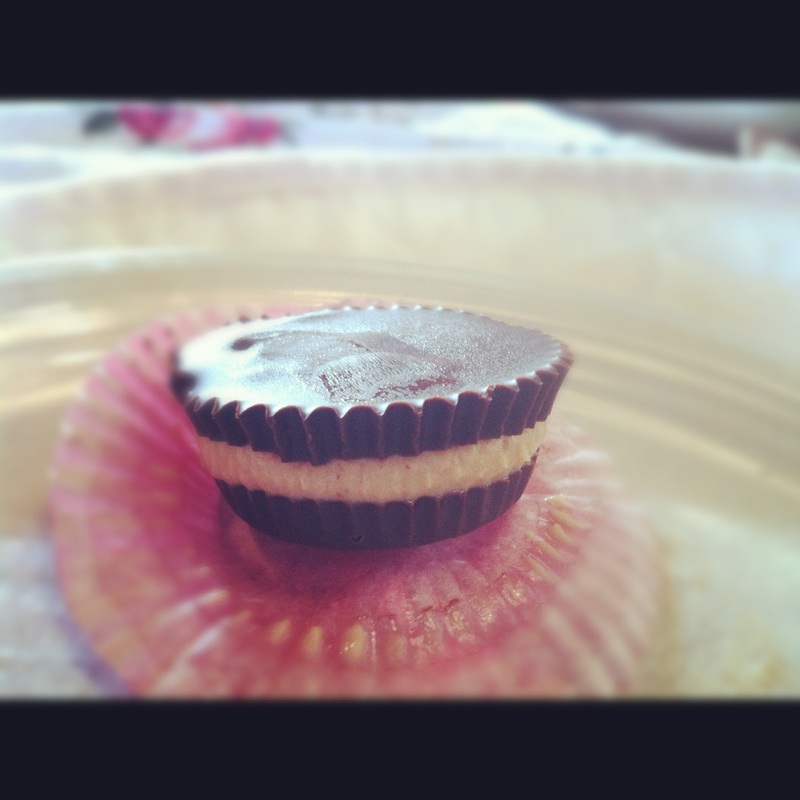 Bang muffin tin on counter a few times in order to smooth/even out the melted chocolate. Place in freezer to harden while preparing filling. 5) While the chocolate is hardening in the freezer, you can begin mixing the peanut butter and butter together in a small bowl, being sure to mix it together very well. I used a cereal bowl and a regular spoon from my flatware set, and mixed until smooth and well-blended. 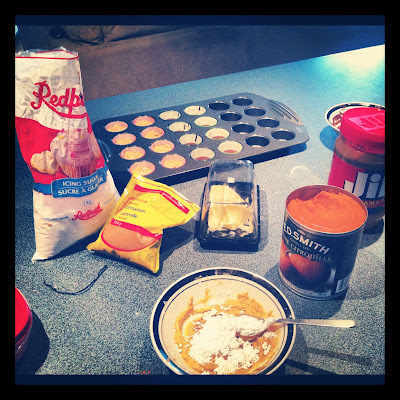 6) You can now start mixing the icing sugar into the peanut butter/butter mixture, being sure to get out any clumps. It may be beneficial to sift the icing sugar first, but I didn't do so myself and it turned out fine. *The filling is the part that can really be experimented with. My measurements for the filling are not exact, I just guesstimated. Honestly, just use my measurements as a guideline and add more (or less) of any of the ingredients as you see fit. Want the filling sweeter? Add more icing sugar. Want it saltier? Add more PB. Go ahead and play with this one, I'm fairly certain that you can't mess it up too badly! 7) Remove the now-hardened chocolate from the freezer and drop a spoonful of the filling onto the chocolate, dividing the mixture up between all 8 cups. I used a spoon to flatten my mixture out a bit, but in all honestly, anything goes here. Leaving it as a lump is just find if you don't care whether or not it's "perfect". 8) Place the muffin tin back into the freezer for another 10-15 minutes to allow the filling to harden before adding the top layer of chocolate. 10) Spoon/pour remaining melted chocolate over filling, being sure to tap on the counter after each one in order to smooth and flatten the tops before the chocolate hardens from the cold filling. 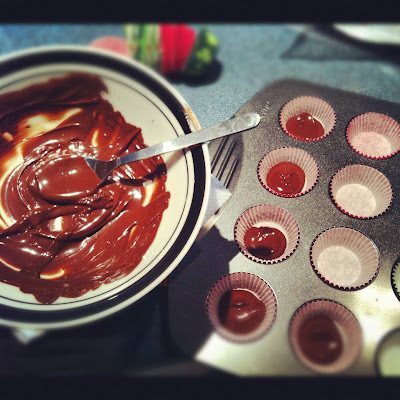 11) Place muffin tin back in freezer for 10-15 minutes to allow top layer of chocolate to harden. 12) Take out of the freezer, peel the wrapper off and enjoy! 5) While the chocolate is hardening in the freezer, you can begin mixing the peanut butter, butter and pumpkin together in a small bowl, being sure to mix it together very well. I used a cereal bowl and a regular spoon from my flatware set, and mixed until smooth and well-blended. 6) You can now start mixing the icing sugar into the peanut butter/butter/pumpkin mixture, being sure to get out any clumps. It may be beneficial to sift the icing sugar first, but I didn't do so myself and it turned out fine. This is also when you'll want to add your cinnamon/pumpkin pie spice, adding a little at a time until you reach your desired flavour. I quickly checked over your blog and I love what I have seen so far! I have added it to my Google Reader so that I can go back and read more after.